Nykaa black magic liquid liner comes in a slender plastic packaging. The long cap handle gives enough flexibility to work and draw different eyeliner shapes. My favorite is the dramatic winged eyeliner, though I'm yet to master it. Whether you want to go for a thin defined line or a thicker line, the brush applicator of this liner delivers the perfect look. It's smooth and glides on easily. And, because, the brush is not dense, there are no clumps while lining the eyes. The color is bold, rich, black and very pigmented. Though, if you like matte liners, this one is not for you because it gives a shine finish. It also dries up pretty quickly. The liner comes off easily with water ( It's water resistant but not water proof ). One thing that gravitated me towards buying this liner was it's affordable price and now that I've used it, I can say that you'll not regret buying this liner. I've worn this for 7 hours on my eyes and it didn't crack. Quality and staying power is amazing and it's reasonably priced too. If you're on a lookout for a new black liner, I'd suggest you to go for this. You can view this post to see how it looks on my eyes. 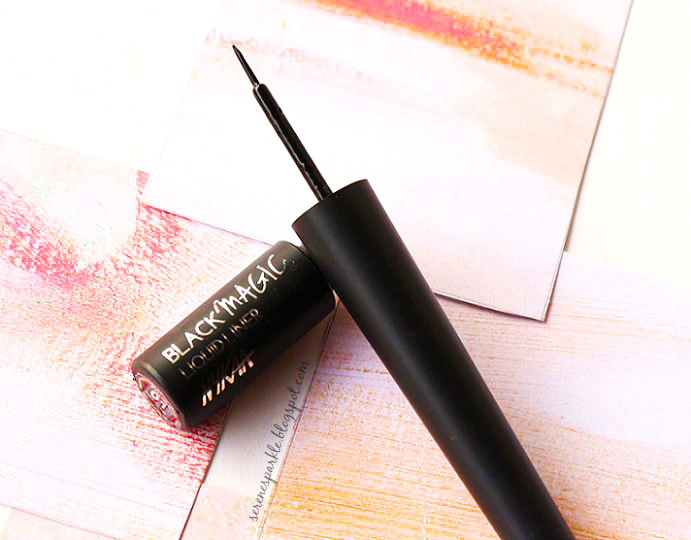 Have you tried the nykaa black magic liquid liner ? Such a great liner. Loved it. Thanks for the review. Nice review! I was confused about buying it and now I'll buy it.